Shortlisted artists have now been selected, for further details see Public Art Awards and Co-Productions. Fingal County Council is embarking on a new phase of Public Art Commissioning utilising funds generated through the Per Cent for Art Scheme. Infrastructure 2017 — 2021 is a local, national and international opportunity open to artists from all disciplines. John Byrne, Sarah Browne and Adam Gibney. Gareth Kennedy, Anthony Haughey & the Migrant Collective, Declan Gorman, Michelle Hall, Aoife Dunne, Yvonne McGuinness. Brian Cregan, Grainne Hallaghan, Faolan Carey, Nollaig Molloy. 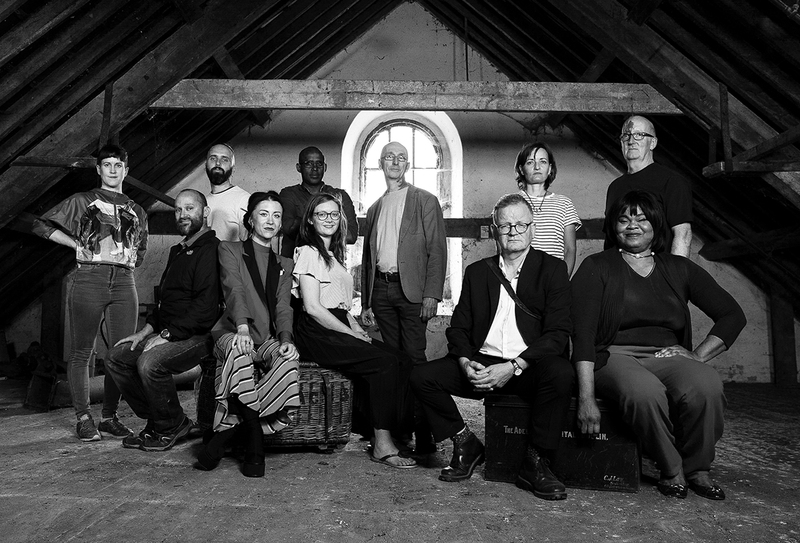 L-R Back row: Sarah Browne, Adam Gibney, Warsame A. Garare, Declan Gorman, Yvonne McGuinness, Anthony Haughey. L-R front row: Gareth Kennedy, Aoife Dunne, Michelle Hall, John Byrne, Lauretta Igbosonu. Fingal County Council is delighted to share the good news from Infrastructure, Fingal County Council’s Public Art Programme 2018 – 2021. Infrastructure 2018 -2021, which is predominantly funded through the Government’s Per Cent for Art scheme, and is valued at €400,000, is co-curated by Fingal County Council’s Public Art Co-ordinator, Caroline Cowley and Independent Curator, Aisling Prior. In 2017 they conducted a countywide consultation to deliver the most appropriate creative brief for artists to respond to. Following an overwhelming response to an Open Call, with almost 300 submissions, three selection phases have been conducted for the Infrastructure commissions. The selection processes featured the expertise of curators, Aisling Prior and Caroline Cowley, academics, Declan Long and Valerie Connor, local public representatives and a range of specialist staff drawn from Fingal County Council’s Community, Heritage, Cultural and Planning departments. The selection processes resulted in nine commissions being awarded to some of Ireland’s most exciting and respected emerging and established artists, all of whom demonstrate an inspiring energy and unique imagination as to how they will make innovative and challenging artworks over the coming three years. The nine commissions, which will be further researched, created, produced and exhibited throughout the county have been awarded under two categories; Public Art Awards – projects which demonstrate a high level of artistic excellence, innovation and ambition for Fingal, and Co-Productions, where artists will work collaboratively with specific Fingal community groups or a new community of interest. A third aspect of the Infrastructure commissioning programme sees artists making artworks for and in the built environment. Internationally acclaimed artist Corban Walker will be making a sculptural installation for the landscaped areas in the new housing development at Hamilton Park in Dublin 15 (read more). practice and literature. Each of the art commissions will align with local communities in new and meaningful ways and will engage with current issues from across the county, to deliver a rich profile of Fingal as it is now. Over half of the artists selected are from Fingal which is a testament to the value of the supports developed and that have been put in place by the Fingal County Council’s Arts Office over the past number of years. Establishing a series of ambitious Public Art projects to take place throughout the county. Facilitating Co-Produced projects, which encourage active engagement between artists, community partners and local hosts. Purchasing artworks for a variety of buildings used by communities in Fingal, giving the opportunity for citizens to actively select contemporary artworks for their individual active spaces. Commissioning bold new artworks for the built environment and public spaces.